In today's edition, the GREAT Act moves forward, Seattle and Washington, DC dominate our city related headlines, a moment of reflection around some Trump administration actions, and more. Image credit: National Parks Service. House committee approves GREAT Act, other good government reforms. We're happy to share the news that the House Oversight and Government Reform Committee voted to advance the GREAT Act, which would result in more open grant data, serving the public interest and helping the United States regain leadership in democratic disclosure. Charles S. Clark has more on yesterday's hearing, which moved forward several additional reform measures, for Government Executive. The GREAT Act moved forward with one potential complication, an amendment introduced by Rep. Gerry Connolly (D-VA) that "would require the Office of Management Budget director and the HHS secretary to evaluate whether open source identifiers are the most beneficial option before determining to choose them over DUNS." (FedScoop) This is a good place for a reminder that we've long been skeptical of the DUNS number and we're not alone. In 2012, the GAO highlighted the problems with giving a monopoly on government entity identification to DUNS' closed, proprietary system. The FCC won't release a video it produced joking about Chairman Ajit Pai being a "Verizon puppet." "At its own discretion, the Federal Communications Commission has chosen to block the release of records related to a video produced last year in which FCC Chairman Ajit Pai and a Verizon executive joke about installing a 'Verizon puppet' as head of the FCC. In a letter to Gizmodo last week, the agency said it was withholding the records from the public in order to prevent harm to the agency—an excuse experts say is a flagrant attempt to skirt federal transparency law." (Gizmodo) Our take? The FCC is improperly claiming the deliberative exemption of the FOIA to justify withholding disclosure of a parody video. The attempt casts another long shadow on Ajit Pai's aspirational claims of transparency. The Space Needle in Seattle rises out of fog. 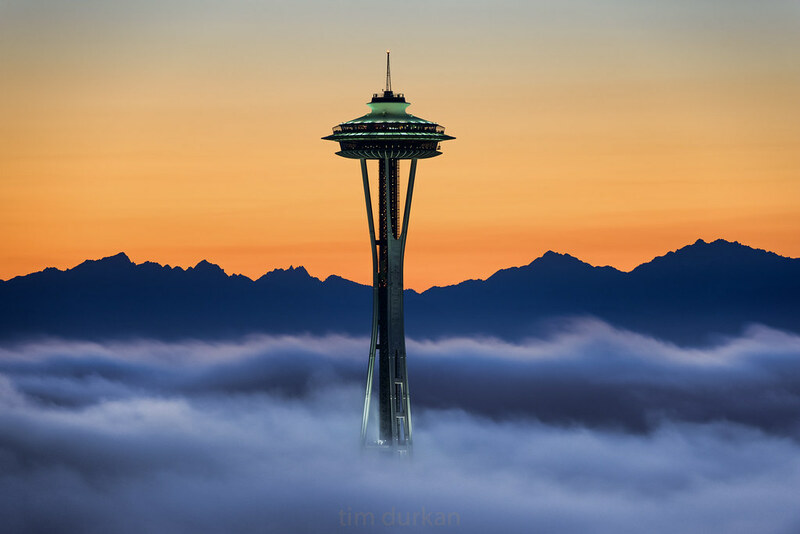 Image Credit: Tim Durkan. D.C. Council approves public campaign financing measure. The D.C. Council unanimously passed the Fair Elections Amendment Act of 2017, which will create a public financing system for campaigns in the District of Columbia. We think this is good news, and a worthy experiment in one of the laboratories of democracy.